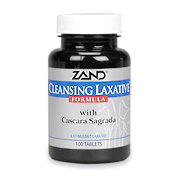 Cleansing Laxative Formula is formulated with cascara sagrada to promote bowel detoxification and elimination while protecting the gastrointestinal tract from irritation. A stimulant laxative. For the relief of occasional constipation. This product generally produces bowel movement in 6 to 12 hours. For adults and children 12 years of age or older: 1 to 3 tablets in a single daily dose. Children under age 12, consult a health care practitioner before using. Do not exceed recommended dosage. Cascara Sagrada Bark 150mg, Proprietary Blend 405mg; Chinese Rhubarb Root, Frangula Bark, Gentian Root, Goldenseal Root, Fennel Seed, Kaolin Clay, Anise Seed, Oregon Grape Root. Cleansing Laxative is shipped in a discrete, unmarked package. Orders are processed immediately and usually take about 3 to 5 working days to be received. We do ask that you try it for 2 to 3 weeks to feel the full effects. Any information received is used only for order processing and shipping purposes. Your information, such as e-mail address, will never be disclosed to a third party.